‘Betting’ – any arrangement under which it is possible to win money, valuable consideration or benefit, by guessing something, including lotteries based on the results of sports matches and contests. These definitions are intentionally broad and, as a result, they overlap somewhat. From an academic perspective, the legislator’s intention was to distinguish lotteries and betting from prohibited games – the former two are based on a specific arrangement or contract between an offeror and offeree, whereas the latter involves an activity defined by the predetermined rules of a particular game. While the Penal Law does not use the terms ‘game of chance’ or ‘game of skill’, the statutory definitions (and the subsequent interpretation of them by Israel’s courts), are predicated on the ‘predominance test’ (as captured by the phrase ‘more by chance than by understanding or ability’). In other words, activities in which skill or knowledge outweigh chance or randomness in determining the outcome will be excluded from the scope of ‘prohibited game’ and ‘lottery’ under Israeli law. Notwithstanding, Israeli courts have added a ‘twist’ to the aforementioned predominance test. In a 2011 ruling, the District Court of Tel Aviv determined that where a particular betting game consists of both skill and chance, the ‘social interest and utility’ of the game in question should also be taken into account before considering its legality.3 In the matter at hand, the court ruled that the hybrid activity was, in fact, a form of prohibited gaming (rejecting an expert opinion stipulating the predominance of skill in determining the outcome of the activity). Furthermore, in a ruling issued in May 2017 (as yet unpublished) the Tel Aviv Magistrate’s Court ruled that when determining whether a particular game is one of chance or skill, the game must be assessed in relation to an amateur player playing a single hand. This ruling is subject to appeal, and does not itself constitute a binding precedent but it is demonstrative of the restrictive view Israeli courts take towards gambling. Against that backdrop, and though the matter has not been addressed to date by Israeli courts, it is the author’s view that Israeli courts are likely to consider activities such as ‘fantasy sports’ as a form of prohibited gambling. While Israeli authorities tolerate true competitions of skill played for prizes, an activity with monetary prizes predicated on the outcome of an external sporting event (or multiple events) is likely to be considered by Israeli courts as falling within the definition of betting, an area exclusively reserved under Israeli law to Israel’s sports-betting monopoly. Binary options, contracts for differences, spread betting and other speculative activities related to financial instruments, currencies, securities and the like, are not considered a form of gambling under Israeli law. These activities are regulated under Securities Law 5728-1968. The Tel Aviv District Court ruled in 2016 that trading in binary options does not constitute a form of prohibited gambling.5 However, the Israeli Securities Authority (the Authority) has prohibited Israeli licensed trading platforms to offer binary options to Israeli retail customers.6 A 2017 amendment to the Securities Law severely restricts the involvement of Israelis in binary options trading (either with Israeli end users or elsewhere). The explanatory notes accompanying the amendment made reference to the Authority’s position regarding the ‘gambling-like’ characteristics of binary options trading. Israel is notoriously conservative with respect to gambling. An intersection of religious and socialist values has resulted in Israel banning most forms of gambling. 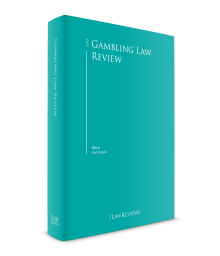 While the laws related to gambling have scarcely changed in recent years, the existing law contains a relatively broad prohibition. The Penal Law prohibits organising ‘lotteries, betting and prohibited games’ (Section 225) and participation in prohibited games (Section 226). Section 225 provides that a person organising or conducting a prohibited game, lottery or betting is liable to a penalty of up to three years’ imprisonment or a fine of up to 452,200 shekels. Section 226 provides that a person playing a prohibited game is liable to a penalty of up to one year’s imprisonment or a fine of up to 29,200 shekels. Oddly, Section 226 does not refer to betting or lotteries. In other words, the sanctions on participation are triggered only by playing a ‘prohibited game’. Israeli courts have expanded upon the language of the Penal Law, most notably by ruling that online gambling and betting available to Israeli consumers violates Israeli law (despite the fact that the law predates the internet). The Israel Police has taken enforcement action against online gaming (focusing primarily, but not exclusively, on operations with an Israeli nexus). After an Israeli court refused to uphold a police order requiring internet service providers (ISPs) to ban access to foreign online betting sites, members of Israel’s parliament tabled a bill to introduce such measures into the Penal Law (the bill did not, eventually, become law). The Bank of Israel has prohibited the transmission of funds related to gambling by Israeli financial institutions, and the State Comptroller has called on all Israeli authorities to take action to curtail the availability of internet gambling in Israel. In short – Israel’s authorities are actively seeking to uphold the gambling ban, both offline and online. Various Israeli governments have considered a limited liberalisation of the blanket ban on bricks-and-mortar gambling, by allowing the construction of a small number of casino resorts in Eilat, a resort destination on the Red Sea. No such initiatives have achieved any meaningful traction. In 2017, the Israeli Minister of Finance revoked the permit granted to the National Lottery to operate a limited number of video lottery terminals (VLTs). This revocation has been judicially challenged by Lottery concessionaires and as at April 2018 the matter remains pending before the High Court of Justice.7 Statements made by the Ministry of Finance suggest that the Ministry further wishes to revoke the permission granted to the Israel Sports Betting Board to conduct horse race wagering. The Ministry of Finance has also announced the establishment of a public committee to review the existing legislation in Israel pertaining to sweepstakes and promotional prize draws, with a view at possibly restricting or re-regulating such activities. The only forms of legal gambling in Israel (other than a very limited exemption for purely social gambling activities) are the national lottery and a limited sports betting service operated by the state. a The National Lottery was established in 1951. It offers several weekly draws, scratch cards, a weekly subscription lottery, and various other lotteries and raffles. The operations of the National Lottery are supervised and regulated by the Ministry of Finance. b The Israel Sports Betting Board (ISBB) was established in 1967 under the Law for the Regularisation of Sports Betting 5727-1967. The ISBB has the exclusive right to organise and regulate sports betting in Israel. It offers betting on football and basketball games, as well as a limited horse race wagering service (the latter activity may be banned by the Ministry of Finance, as noted above). The regulation of gambling in Israel is entirely on the national level (local authorities have no jurisdiction on gambling-related matters). Notwithstanding, there have been proposals (none of which have progressed) to carve-out Israel’s prime resort location, the city of Eilat, from the general prohibition on terrestrial gambling. With respect to online gambling, Israeli courts have ruled that Israeli law applies to online gambling conducted by foreign operators, when it is made available to Israeli players. In other words, when a party to the gambling transaction is located in Israel, the entire activity would be viewed as a violation of the prohibition on gambling. Enforcement has focused on operators specifically targeting the Israeli market (i.e., advertising to Israelis, using the Hebrew language, etc. ).8 To date, Israeli authorities have never taken enforcement action against foreign operators with no presence in Israel, that have not specifically targeted the Israeli market. As noted, the police have attempted to order Israeli ISPs to block access to a specific list of online gambling sites, however the blocking orders were appealed by the ISPs and struck down by the Israeli Supreme Court for lack of explicit legal authority.9 A bill that would empower police to issue orders aimed at preventing those in Israel from accessing websites offering online gambling services was presented to Israel’s legislature, but was not passed into law. Furthermore, in 2010 the Israeli State Comptroller published a comprehensive analysis of the illegal online gambling market in Israel. The report covered a broad spectrum of governmental agencies. The State Comptroller has urged Israeli enforcement authorities to implement the necessary measures to disrupt gambling-related transactions and block access to illegal gambling websites from within Israel. The primary piece of legislation regulating gambling in Israel (i.e., the prohibition on gambling) is Chapter 12 of the Penal Law. The Penal Law defines the types of activities that constitute gambling and betting, the prohibitions applicable to such activities, and the limited exemptions available under law. Additionally, the Law for the Regularisation of Sports Betting 5727-1967 governs the activities of the ISBB. The only forms of regulated gambling in Israel are the National Lottery, regulated by the Ministry of Finance, and the ISBB (which is a self-regulating statutory corporation). Israeli law does not separately regulate remote and terrestrial gambling. In fact, the law does not specifically refer to remote gambling. The application of the Penal Law to remote gambling was the result of a judicial interpretation of the scope of the law. Land-based gambling (other than the National Lottery and the national sports betting offering) is illegal under Israeli law. With the exception of the online betting services offered by the ISBB, online gambling is illegal under Israeli law. Commercial gambling is illegal in Israel, so this section is not applicable. Israeli law enforcement agencies have taken action against unlawful gambling operations. The police have raided unlawful gambling houses and venues used for gambling, and have also taken action against individuals and businesses involved in unlawful online gambling. To date, direct enforcement action has focused primarily on gambling operations conducted by organised crime or from within Israel itself. Gambling offences are considered source offences under the Prevention of Money Laundering Law 5760-2000. Therefore, unlawful gambling activity may also constitute a money laundering offence. Indeed, individuals involved in unlawful gambling activity have been indicted and convicted of money laundering offences in addition to primary convictions for unlawful gambling offences. Since commercial gambling is unlawful in Israel, and the only lawful forms of gambling are conducted by the state, the only relevant tax is the tax on gambling winnings. The winners of prizes (including prizes from lotteries and betting organised by the ISBB) may be subject to taxation. Prizes in excess of 50,000 shekels are subject to withholding tax at source. Tax rates are incremental for prizes between 50,000 shekels and 100,000 shekels, and are set at 30 per cent for prizes above 100,000 shekels. If a person offers, sells or distributes tickets or anything else that attests to a right to participate in any lottery or betting, or if he prints or publishes an announcement of a lottery or betting, he is liable to one year imprisonment or a fine of 150,600 shekels. The law does not distinguish online advertising from traditional advertising, nor does it distinguish advertising for foreign gambling operations from advertising of local operations. Historically, the police have taken action against advertisers specifically targeting Israeli customers, both online and offline. In 2017 the Ministry of Finance imposed strict limitations on the advertising of gambling activities by the National Lottery. The most significant development over the past year has been the decision by the Ministry of Finance to revoke the permit previously granted to the National Lottery to operate a limited number of VLTs. The revocation occurred as part of the renewal of the National Lottery’s licence. The Ministry’s decision to revoke the permit was strongly opposed by Lottery concessionaires as well as by local government (which is a major recipient of Lottery revenue). The decision to revoke the permit has been judicially challenged and the matter remains pending before the High Court of Justice (as at April 2018). In addition, the Ministry of Finance has announced that it intends to further restrict the availability of gambling in Israel by disallowing the offering of horse race wagering by the ISBB. The Ministry is also considering revising the existing regulations on sweepstakes and promotional draws, a move that may result in such activities being further restricted. Finally, in October 2017, the Israeli Knesset adopted legislation effectively banning the participation of Israelis in binary options trading and ancillary activity. As noted, Israel is notoriously conservative with respect to gambling. Therefore, it is unlikely that the coming year will bring any liberalisation to the market. In fact, it is more likely that the coming year will see the introduction of bills intended to further restrict the availability and proliferation of online gaming (e.g., through ISP blocking measures) and additional restrictions on the activities of the National Lottery and ISBB. 1 Yehoshua Shohat Gurtler is a partner at Herzog Fox & Neeman Law Office. 2 There is no official translation of the Israeli Penal Law. The translated text used here is from ‘Penal Law 5737-1977’ Aryeh Greenefield, 1996. 3 Class Action (Tel Aviv) 30284-01-10 Simon Davush v. Connective Group Ltd.
4 Announcement Regarding General Permit for the Conduct of Lotteries for Commercial Promotion Under the Penal Law 5737-1977 (in effect as of 1 January 2010). 5 Class Action 25717-10-13 Bar-Or et al v. ETrader Ltd et al. 6 Announcement dated 22 March 2016 – ‘Israeli Securities Authority Has Decided Not to Allow Trading in Binary Options on Trading Platforms’ (available in Hebrew at http://goo.gl/PKOvbO). 7 HCJ 239/17 Haim Tal et al v. Minister of Finance. 8 Regarding the classification of foreign entities offering services in Israel see, Class Action (Tel Aviv) 30284-01-10 Simon Davush v. Connective Group Ltd and Special Requests (Tel Aviv), 908617/07 Carlton v. The National Unit for the Investigation of Fraud. 9 Administrative Appeal (Supreme Court) 3782/12 The Commander of the Tel Aviv-Jaffa District Israel Police Israel v. The Israel Internet Association. 10 Bank of Israel, Supervision of Banks Division, Conduct of Banking Business Procedure No. 411.